Drinking coffee late at night is a time-honored tradition for coffee-drinkers and a rite of passage for most ambitious young people, who pull their first all-nighter in high school. There is evidence of coffee-drinking in Edward Hoppers’s 1942 oil-on-canvas painting, “Nighthawks.” This famous painting was on view in early fall at the Whitney as part of a major exhibition that surveyed the drawings and paintings of Edward Hopper, while focusing on how he developed his work, conceptually and artistically, from idea, to drawing, to revision, to painting. 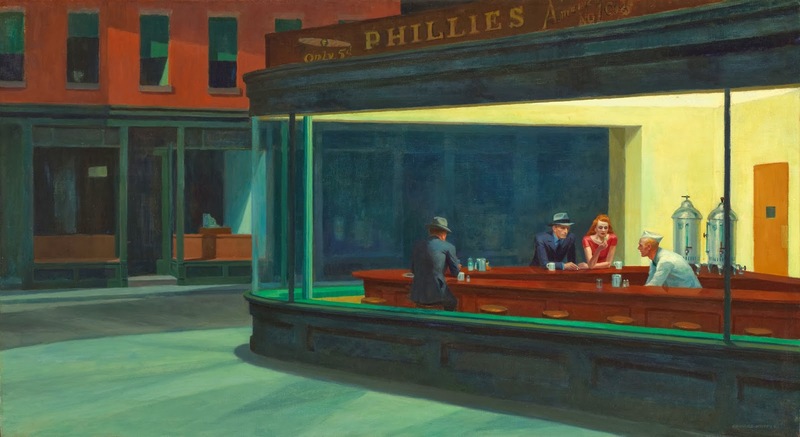 “Nighthawks” which portrays four people in a late-night diner, situated on the corner of three intersecting streets in the West Village, pays homage to urban anomie, personal freedom---and late-night coffee-drinking. And while Hopper’s ability to masterfully present light and illumination is on full display in this painting, rife with shades of maroon, taupe, and chestnut brown—with a dab of bright red and canary yellow---it is the seeming aloneness of the individual diner-dwellers that is most striking. Look at those clean cut people sitting alone, apparently ruminating on who knows what. Presumably the coffee they are drinking only serves to make them more wakeful, thoughtful and potentially ready for action. But indeed, all of the action it seems is internal---and in the flush of light humming down from the backlit expanse of the diner’s ceiling. What is it about this painting that feels timeless and evokes a sense of recognition from almost everyone who sees it? Clearly, it is the innate knowledge and sense that it is possible to be alone and together at the same time. While at the Whitney a couple of weeks ago, I enjoyed a skim latte. It was well made, nicely served and energizing. 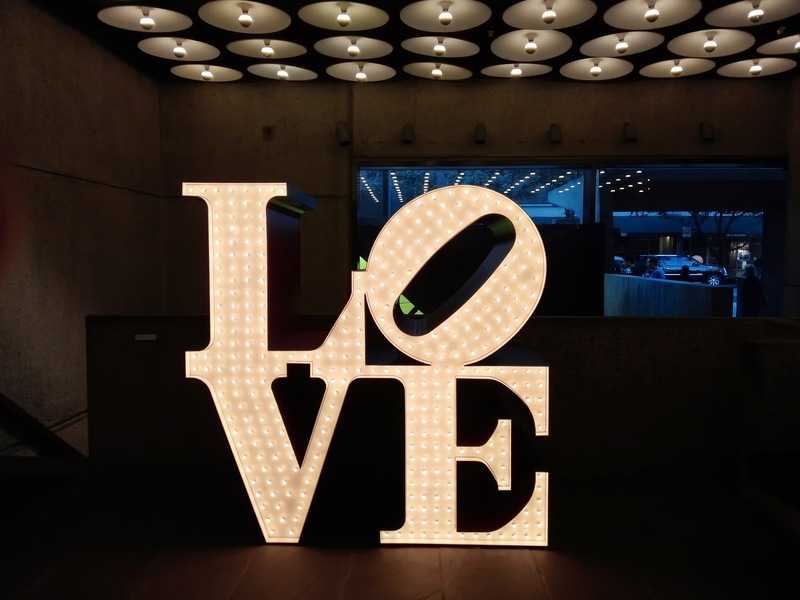 But what really made it special was the big LOVE sign that graced the entrance/exit of the Whitney---in homage to the Robert Indiana exhibit, which is still at the Whitney as this post is written. And finally, one more reason to love coffee and appreciate its health benefits. 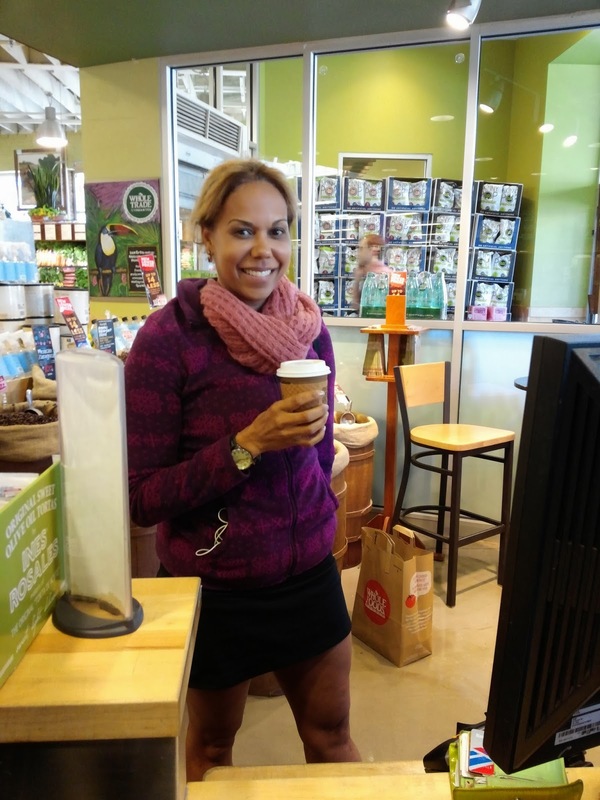 A recent study published in the journal Physiology & Behavior found that the average metabolic rate of people who drink caffeinated coffee is 16 percent higher than those who drank decaf. So really, when it comes down to drinking coffee at the Whitney, you have the chance to be metabolically boosted, artistically edified---and maybe even happy alone/together. The use of the phrase; urban anomie, was enjoyable. There is an on-line newspaper called; 'Urban Anomie,' which bills itself as; "Calgary's Least-Trusted News Source." Alone together, that's what city life is like for many. Perceptive of you to recognize this. 'Been away rebuilding a computer system (which is now alive and well, pour l'instant ca va). SomaFM free internet radio is already cranking up the X-mas tunes! Check it out. The flagship channel is Groove Salad which is one of the most popular free internet radio stations. Shoutcast.com has 'em all.